Flemish painter Jan Van Eyck’s “St. 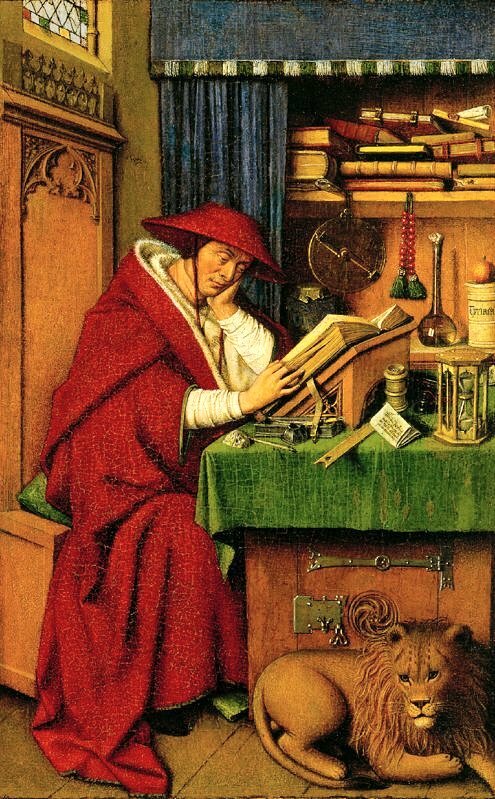 Jerome in his study” (1435-1440). Jerome is often represented as a scholar with a book, which represent his numerous writings. The hourglass on the table is among the symbols of a penitent hermit. The cardinal’s hat he is wearing in this image is the result of a mistaken interpretation in the Middle Ages of the events in his life (and the clothing he is wearing in this image would only be begun being worn by cardinals around 1252, St. Jerome lived from approx 341-420A.D.). After the holidays here I’m busy getting work done that will be in the “Keeping Vigil” solo exhibition I have at University of Portland that opens Monday on the 10th. St. Jerome is an ascetic who lived in the Syrian Desert in the mid 370’s, but he was also a pioneer in maintaining friends through letter writing. The letters he sent to three of his friends when he was in isolation are full of warmth, care and longing. “If illness and the summer heat and the difficulties of sea travel did not hinder me, I would hurry to you. I long for you more than the sailor longs to reach harbor after a storm. I long for you more than the parched field longs for rain and more than the anxious mother sitting on shore waiting for her son.” St. Jerome is uninhibited in his emotion as he expresses his desire to see his friend Rufinus, so much so that he declares his feelings as being deeper than what is thought to be the deepest human love, that between a mother and child. Who better to assist the supplicant figure I was making for the work? Some one who knows what it is to be isolated and in need of connection. I’ll show you images of the finished work shortly here. But before that I want to share with you a couple things I learned about our desert saint. The Golden Legend speaks about how in a monastery in Bethlehem Jerome healed a wounded lion that had a thorn in his paw, so Jerome is always represented with this lion, who apparently went with him after that wherever he went. In addition the lion symbolizes how compassion conquers brute force. St. Jerome would live as a hermit for four years (and often represented in that manner) but then after studying in Constantinople with Saint Gregory Nazianzen he would move to Rome eventually retiring in Bethlehem. This entry was posted in Interesting.... and tagged desert fathers, friendship in letters, saint, Saints in art, St. Jerome, Tim Timmerman. Bookmark the permalink.